Each Monday brings the chance to join Cathy’s In A Vase On Monday to share an arrangement using materials gathered from the garden. Today I have two small, but colorful, vases to share. 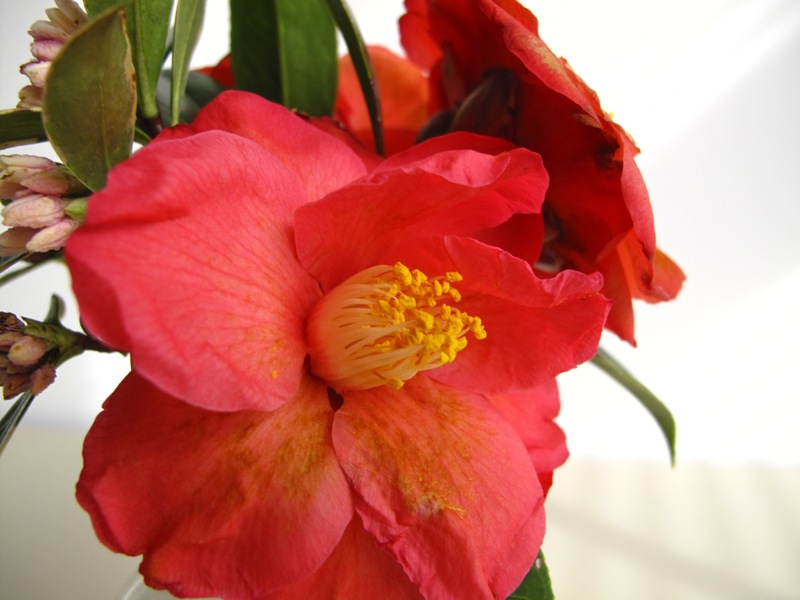 The first vase honors a Coral Delight camellia that burst in bloom Friday despite frigid temperatures. 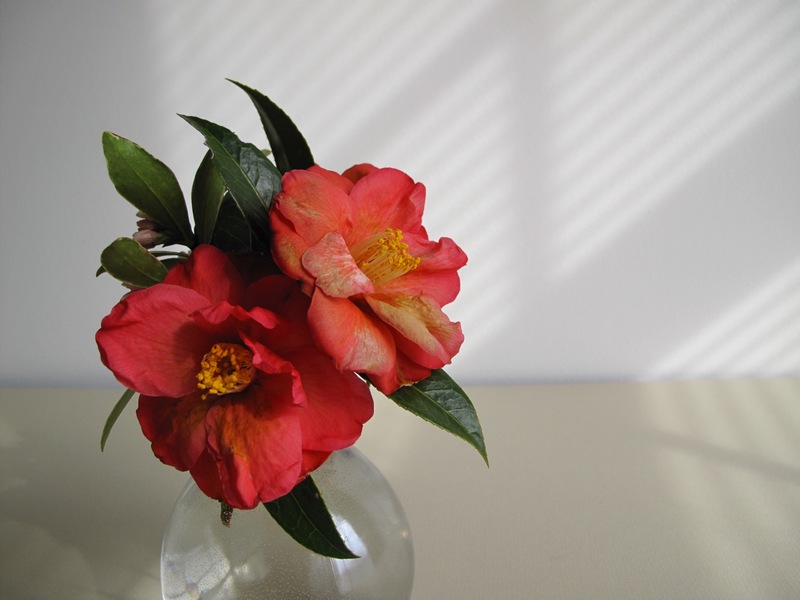 I cut the three semidouble flowers that were open and brought them indoors Saturday. By Sunday when I photographed them, they had faded significantly, but in a graceful, dignified way that I find compelling. Once again a cutting of Daphne odora fills out the vase. It was 15°F Saturday night yet anemones were freshly budding when I went out early Sunday morning to check out the garden. The anemone stems were only two or three inches above the soil and their flowers were tiny, the size of my thumbnail. Across the way a couple of undersized, misguided daffodil buds revealed their yellow petals. Daffodils have been very hesitant to open in this unpredictable weather. Usually by now many more would be open and the flowers would be much larger. I chose a vase with a fairly small neck, yet the flowers sink and are a bit overwhelmed by the size of the container (4.25 inches high x 2.25 inches wide). A. coronaria ‘Mr. Fokker’ is more lavender than these photographs portray. I experimented with a setting the color option on my camera to “vivid” and I like the resulting strong color, but the flower’s blue is overstated in these images. This entry was posted in garden and tagged Anemone coronaria 'Bride', Anemone coronaria ‘Mr. Fokker’, Camellia 'Coral Delight', Euphorbia 'Shorty' (Shorty Spurge), flower arranging, flower design, in a vase on monday, narcissus, nature photography on February 15, 2016 by pbmgarden. Your temperatures are so low suddenly, I hope you’re keeping warm indoors. Lovely Anemones, and interesting that that open so small when it is cold. We had sleet and snow overnight but it should warm up for the rest of the week. I’m ready to get outdoors a bit. I’m hoping these anemones gather some strength as spring arrives. None of the new anemones planted in fall show any sign of growth. My newly planted white Anemones are flowering but not any of the other colours. The blue anemone is simply stunning. What a color! It’s actually more lavender than the camera reports, but still quite strong. 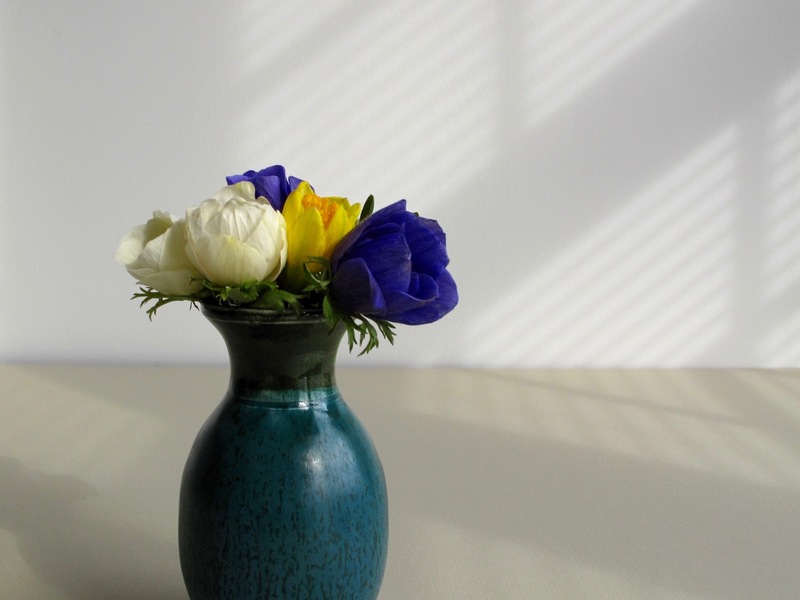 I think simple vases are so elegant Susie. 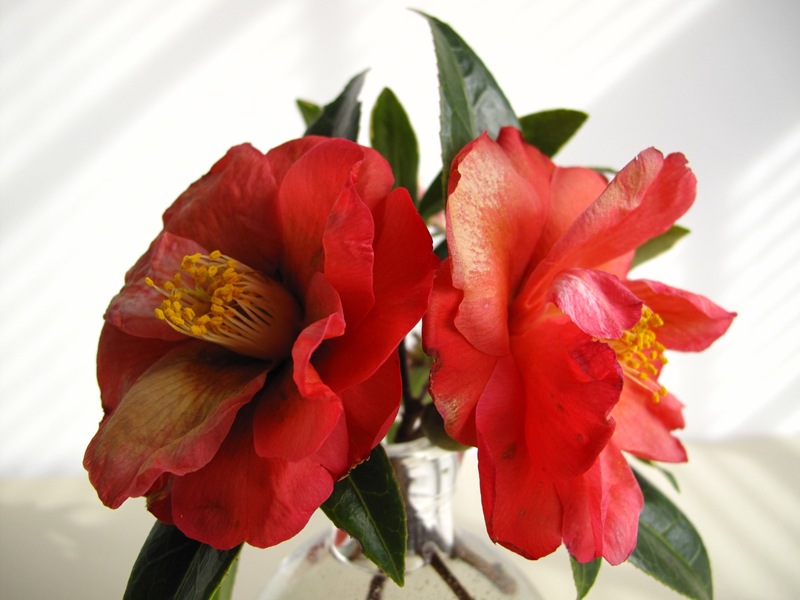 The camellias so lovely, but I think I adore the anemones in bud the best today! Isn’t it amazing how resilient our gardens are….mine is snuggled below 3 ft of snow thankfully. -20 is sticking around now for about the 4th or 5th day…. Stay warm Donna! It is amazing to be able to pluck a few blossoms in the cold of winter. Your vases are lovely Susie, I wish I had grown Anemones this spring, they look like a really joyful flower to have in your garden and in your vases. Thanks Julie. I tried planting anemones in early spring several years ago but Christina suggested I’d have better luck planting them in fall. She was right–These have done amazing things but the first batch disappeared. Although it has been cold here (but nothing like your temps!) 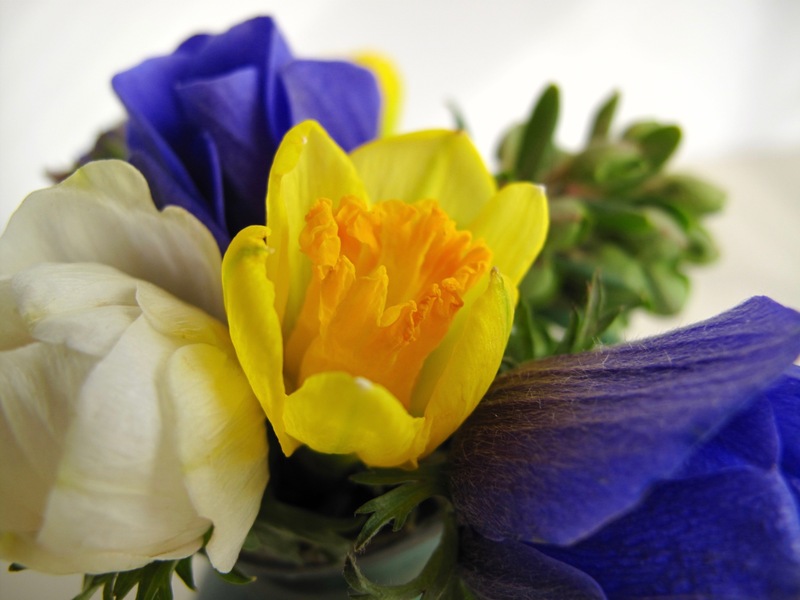 it has been very sunny so all the daffs and crocus and snowdrops are opening up nicely. Your teeny tiny anemones are so sweet, and how can I not love your little euphorbia with a name like that (guess what the Golfer calls me…! ), whilst your anemone is just as striking when slightly faded. Aren’t we privileged to be finding blooms in our gardens when it is so chilly outside? Thanks for sharing your nickname Cathy! Yes, you’re right. We are so privileged to have blooms this time of year. Even just one or two in winter is a treat. I will always think of one of my favorite professors when I see a camellia. 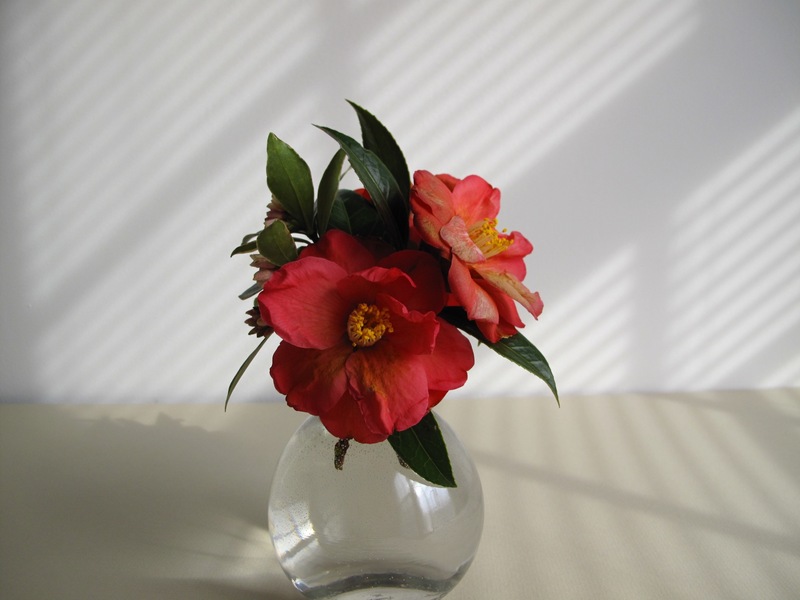 His name was Parks and he invited us all to his home to see his camellia gardens. He was a hybridizer. I loved UNC! Dr. Parks’ son, David, owns Camellia Forest Nursery just outside of town. I’m hoping to make a visit there soon. Funny story about your mother-in-law, but too bad about the daphne! Wow. I will be heading that way, too. Thanks for this info. It’s a small world! Two utterly perfect vases. Both make me long for spring to arrive! Thanks Linda. Fortunately we’re closer to spring every day. Have to keep reminding myself of that–we’re stuck at home today with a snow/sleet storm. Definitely the perfect start for any Monday morning. Flowers are fun. Have a great week Charlie! 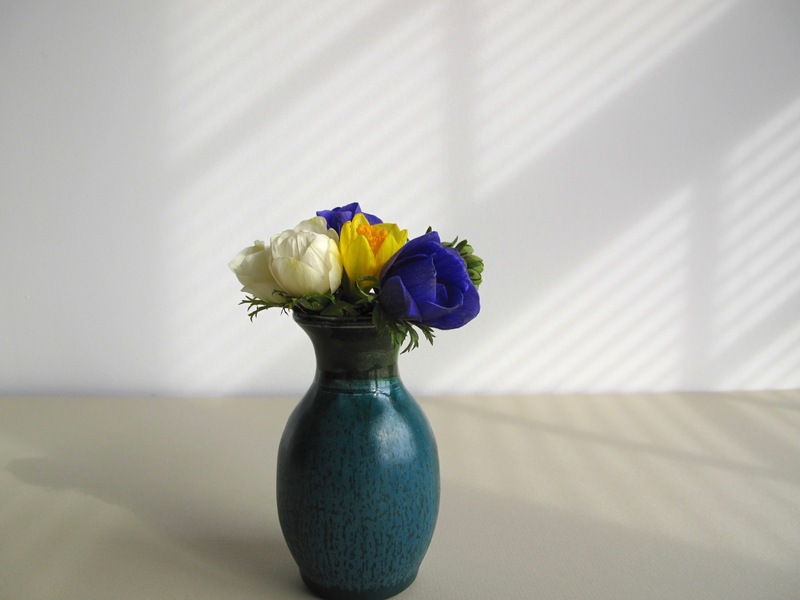 Your pretty arrangements are made even better with the setting with shadows on the wall. Thanks. That spot is turning out to be a favorite setting for shooting photos. These are perfect and so beautifully photographed. 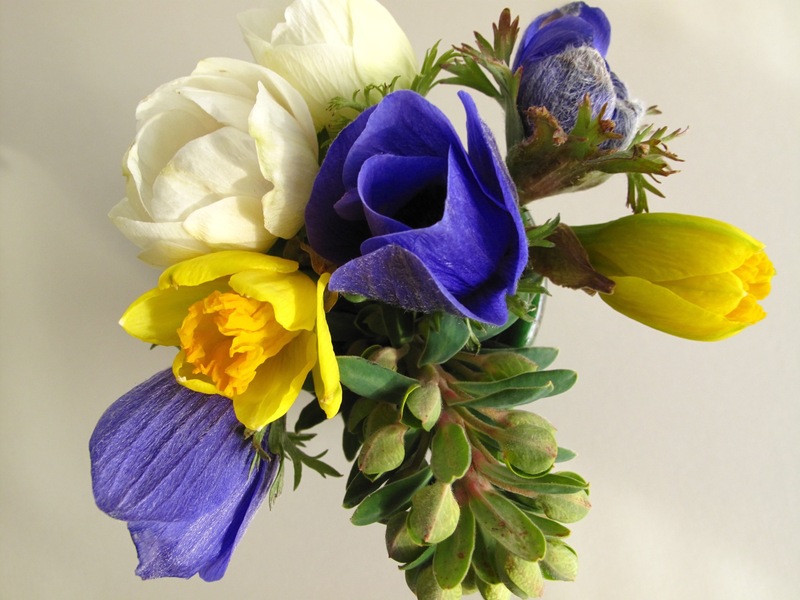 I know exactly what you mean about faded elegance, it’s part of the pleasure of picking and arranging our own flowers. It can be interesting to see how flowers age. Some go quickly. The daphne I’ve been bringing in seems to hold up for a couple of weeks, but once I move the vase, the leaves and flowers seems to shatter. Other flowers last so long i actually just get tired of them. Both vases are lovely, Susie. I hope the frigid temperatures are abating – I wouldn’t want to see your beautiful anemones go into hiding. Thanks Kris. After snow, sleet and rain on Monday, things have changed for the better. Nearly 60F the rest of the week. Much easier to deal with. Now if the garden would dry out I might even enjoy some weeding! 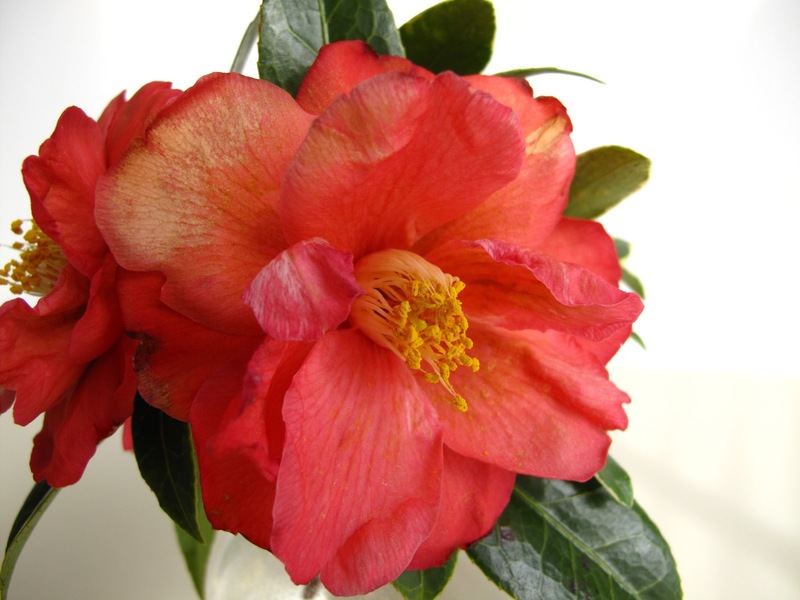 You have managed to tempt to…I have bought my first camelia plant…need I say more? Well I do love both your arrangements. Oh, good for you Noelle. What kind did you get? I adore blue and yellow also Cathy. 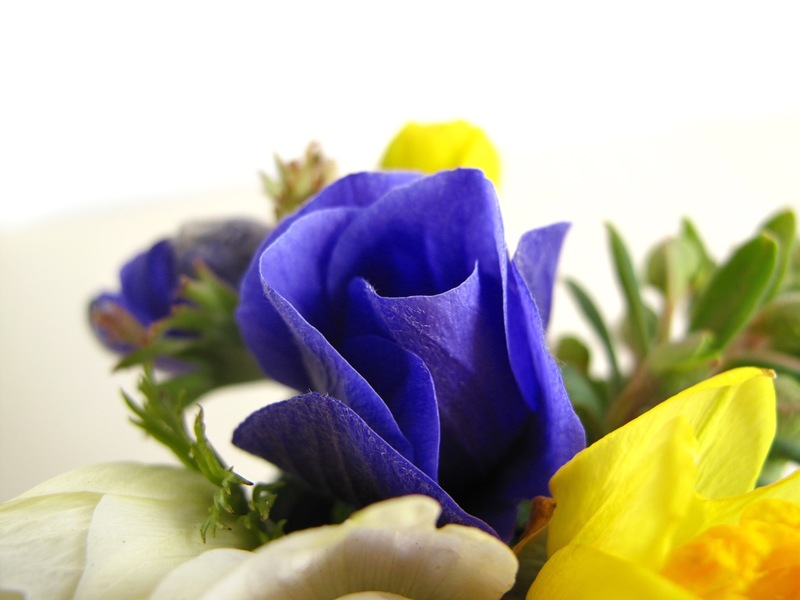 My daughter used those colors for her wedding flowers. Love that blue, white and yellow! The Narcissi really give the whole thing some zip.